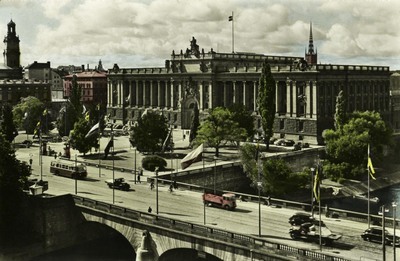 "Sweden – Stockholm, Riksdagshuset och Norrbro"
Stockholm. Riksdagshuset och Norrbro. The Riksdag Building. The Swedish Riksdag, which, next to the English Parliament, is the oldest representative body in Europe, dates from the year 1435. One color postcard with a divided back. The postcard was published by Nordisk Konst in Stockholm, Sweden.